This DVD contains 164 individual materials, comprising of over 492 individual, handcrafted texture maps. 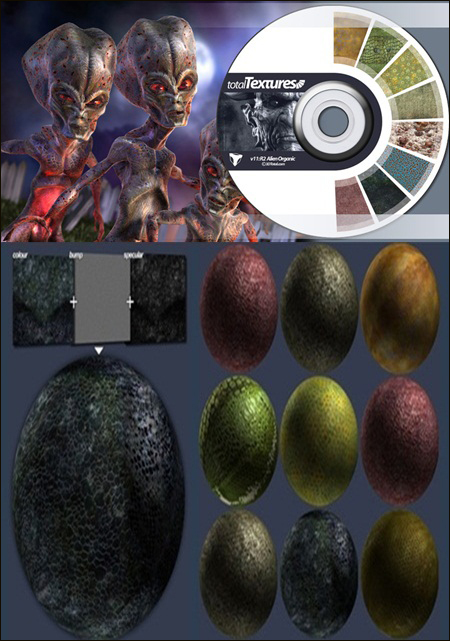 Every texture has its own unique colour map, bump map and specular maps. The textures are split into two main sections, categorised by firstly colour, then sets. The colour textures are arranged by whatever the dominant colour is within the texture. These textures are however very flexible and the colour can be changed to suit your needs. The texture sets are designed to be used as a group in their entirety to fully map a character, and are therefore broken into categories that correspond to the various body parts. There are two maps aimed at texturing the body (front and back) which can be placed alongside each other, as the vertical edges match creating a seamless “wrap around”. Likewise, there are two sets for the arms and legs, plus a tentacle version. The idea is that each texture can be combined to help create a complete map across an entire mesh, and one that describes the numerous areas of detail and keeps the style consistent throughout.